Its my day over at Ai blog!! Today made a super fun card!! I ♥♥♥ these Funny Ai images!!! This image is from Ai- Bird Brains collection. Each and every image of this series just Cracks me up!! I used the chicken wire stamp for my background. Did you see the sentiment...how fun is that??? Look at their facial expressions..lol!! 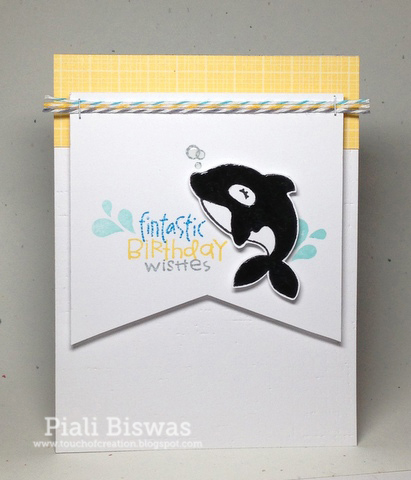 A super simple card with very basic coloring...quick & easy!! 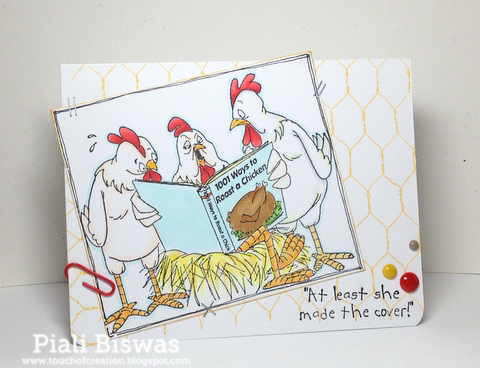 Cute Card Thursday: Fly like a bird. Creative Card Crew : no DP. Did you see the new Ai challenge yet?? If not, just check it out HERE. Kids are already driving me crazy in two days...its gonna be a looooooooooong summer!!! You may see lesser blog post here as I will be busy with the girls. Here is my card for this month's RIBBON CAROUSEL Challenge. Don't you love that lil' guy ??? Its an ART IMPRESSION stamp from their BEACH BUM set. The sun is from HERO ARTS. The sentiment stickers are from Echo Park. 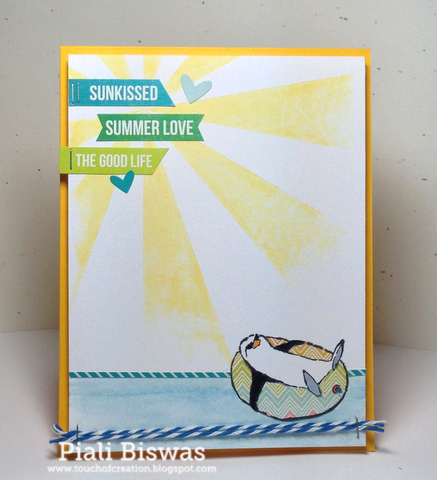 Eureka Stamps: Summer time Fun. Make My Monday: Summer scenes. Its new Release time!!! Yay!!! 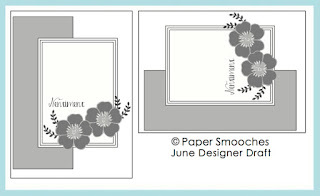 This month CASual Fridays Stamp is releasing 3 AWESOME sets...and today we're sharing sneak peek of.. I can just say this....Michele has done her MAGIC again with the sentiments..love them!! Before I share my cards...did you see the sneak peeks "Wonderful Words" Yet???? No...please check it out HERE. Make sure to leave a comment on CFS Blog every day to win a Stamp set! 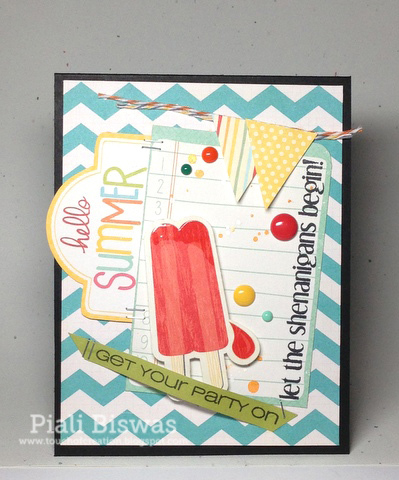 Just a super fun Summer celebration card!!!! 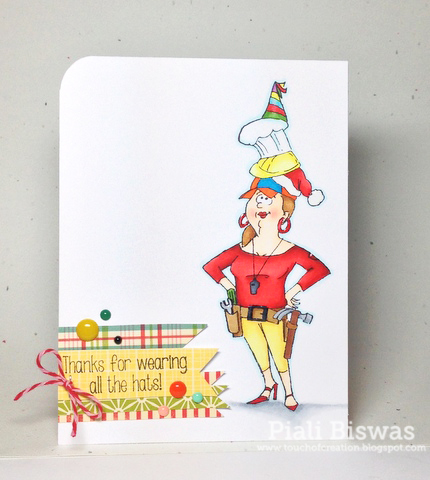 I love all the mix of patterns and colors in this card...FUN!! All the papers and journalling cards are from Echo park. I also used a sentiment from Woot Woot set. 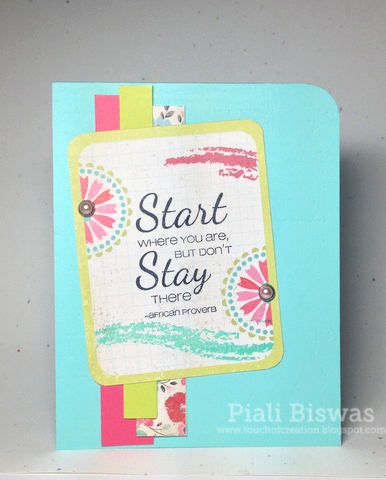 Moxie Fab World :Mixy -Matchy challenge. Loooooooooooooooove all the sentiments in THIS set!!! Just added some arrows/chevrons from the RAD set to this colorful card. Cards in Envy: Faux/Real Stitches. Cupcake Craft: Sentiment as Main focus. 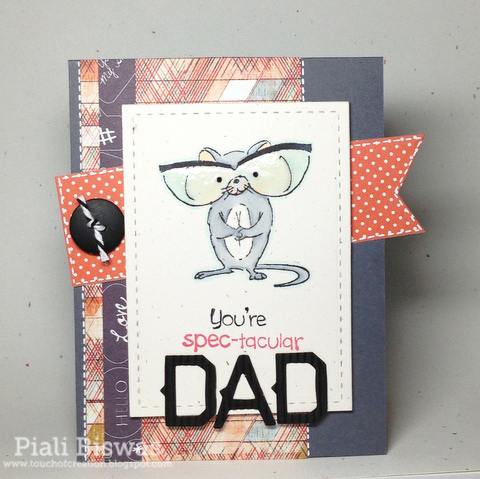 Now hop over to CFS Blog to look at the amazing DT creations and win some new stamps!!! 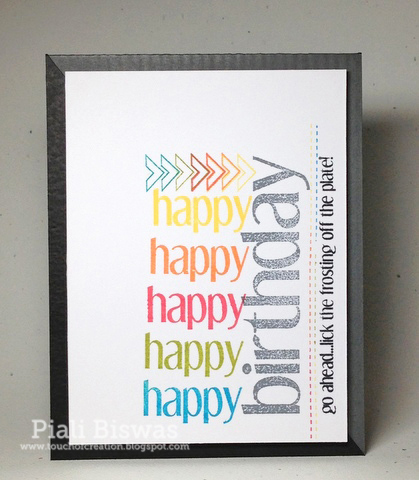 Welcome to Art Impressions Stamps & Operation Write Home New release bloghop!! We're having this hop as a launch party of two new Ai-OWH stamp sets ..
First up is CAS card using Ai- OWH "Sending love" set. 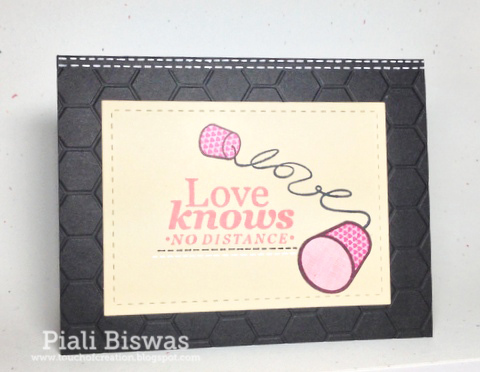 I paper pieced the image and stamped the sentiment with color ink...super quick & easy!!! I also dry embossed the cardbase. Here is the inside of the card..
You must have seen this card over at Crafter's Home blog. You don't have to use Ai-OWH " Every Hat" set for coloring or paper piecing only. This image is great for super quick and easy cards!! We can whip up several of them for our Troops. Like I did here...just stamped the image with various inks. Make sure to leave a comment on each blog to win a $50 prize package from Art Impressions Stamps. Check HERE for all the hop details and full reveal of the stamp sets. Here is a catch up post.. I had super busy weekend and Monday was my little one's Birthday. She is not little anymore( I just don't want her to get BIG..I love my baby), she turned 8!!!! Here are some CASual Fridays Stamps cards...if you've missed the post..HERE. I did some fun thing...I always like to buy the journaling card sort of things from different paper companies.As you all know I'm not a scrapbooker, I hardly use them...so finally used them on my card with some stamping on it. This journaling spot is from Echo Park. I used Hero Arts - Tide Pool and Pale Tomato inks to stamp my Brushstroke image from Breathe stamp set...its a perfect match of colors!! Stamped the lovely quote from the same stamp set. The pearl brads are from My Mind's Eye. I also used some patterned paper from Crate Paper. Yep! I know its quite a mix-match of lots products from different manufactures...sometimes its fun to do so! Created With Love: Anything Goes. Challenges 4 Everybody : Anything Goes. I stamped the border from the Stop stamp set using various Hero Arts Mid-tone inks. Added a sentiment from Mums the Word stamp set. Just embellished with few MME enamel dots. 613 Avenue Create : Anything Goes+ celebration. This month we'eve teamed up with The Robins Nest ..
Stop by to check the card ....Click HERE! I'm back again ...we've another sponsored challenge today!!! 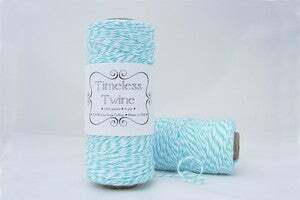 Timeless Twine is sponsoring 10 Minute Craft Dash challenge.. If you're following me for a while..you know I love this challenge...its super color challenge where you have to create your card in less than 10 minutes. 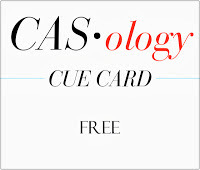 No Stamping, No diecutting...just a super CAS card. I love this sentiment from Echo Park ...I truely believe it" Happy Girl is a Pretty Girl" ..yes! Smile makes a difference!!! Just created some splatters with Studio Calico Mister huey..most time went on drying it and tie the twine, rest was super quick. Just trimmed few patterned paper pieces and adhere it to the card front. 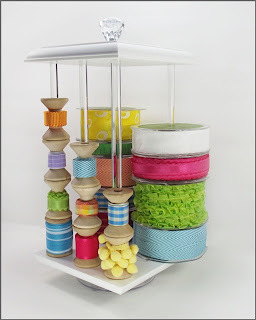 Craft Room Challenge : Use your scraps. Make it Monday with Kraft Outlet: CAS. The Crazy Challenge: Use sentiments. Here is the fabulous prize you can win!!!! Make sure to visit 10 minute Craft Dash challenge blog for all the details.